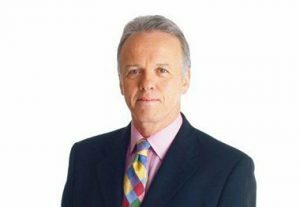 Cancer Focus NI has benefited from celebrity support from many well-known figures over the years, from campaign ambassadors and guest speakers to willing event participants. Take a quick look to see who has supported our work recently. 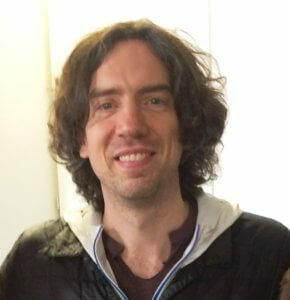 The Bangor-born frontman of chart-topping band Snow Patrol popped by the Cancer Focus NI office in March 2018 to meet staff and find out a bit more about the work we do. Gary has offered to help the charity promote its 50th anniversary celebrations next year. The country superstar, who was born in Liverpool but now lives in Co Fermanagh, took time out from his Ireland/UK tour to help Cancer Focus NI promote its Strictly Goes Country event. 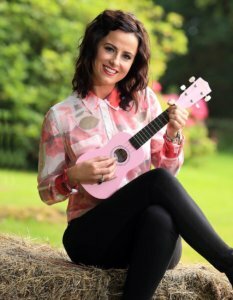 The Co Derry songbird teamed up with Cancer Focus NI to hold bucket collections at her recent gig at the Black Box in Belfast and plugged the charity’s work on U105 and Radio Ulster ahead of the show. She also dropped into the office to perform an acoustic version of her beautiful track, Golden Wings, written in memory of a young friend who died from cancer. 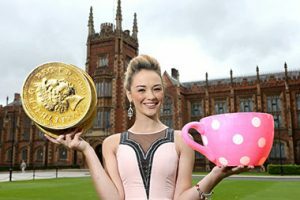 Big Brother finalist Ashleigh Coyle backed our 2014 Girls’ Night In campaign to raise funds for pioneering breast cancer research at Queen’s University Belfast. 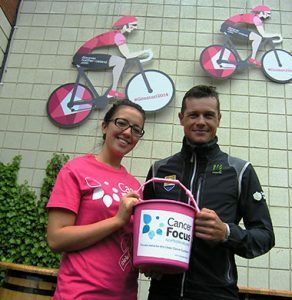 Professional Irish cyclist Nicholas Roche showed his support for the Cancer Focus NI street collection at the 2014 Giro D’Italia and encouraged people to give generously. 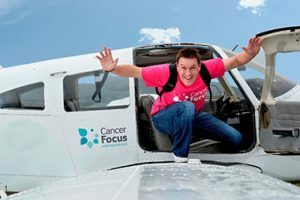 Cool FM DJ Gareth Stewart helped launch our November 2014 skydive to raise funds for pioneering breast cancer research that we fund at Queen’s University, Belfast. 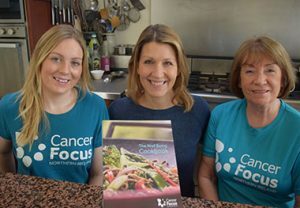 Chef Jeanne Rankin helped Cancer Focus NI staff members Niamh McDaid (L) and Deirdre Conlon (R) write our Keeping Well cookbook to help cancer patients during treatment, with their recovery and to help them stay well in the future. Winner of BBC’s The Apprentice Leah Totten launched our Girls’ Night In fundraiser for breast cancer awareness in October 2013 with Caroline McNelis. Noel Thompson is the Patron for the Cancer Focus NI and Crescent Arts Centre Sing for Life Choir and often comperes at concerts. 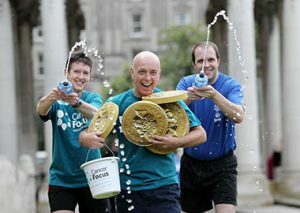 Olympic rowing silver medallists Peter and Richard Chambers were Cancer Focus NI ambassadors for the Belfast Marathon 2013. World renowned golfer, Darren Clarke, got into the swing of fundraising with the help of Rockmount Golf Club captains, Mark McConkey and Helen Hall, and donated to the ‘Rockmount goes Pink’ campaign 2009. 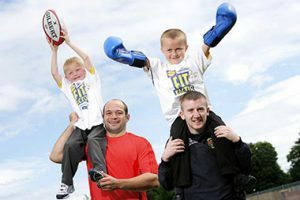 Ulster rugby star Rory Best and Olympic boxer Paddy Barnes celebrate the 2009 Lidl Fit Factor Champions, Paul McConville and Jake McGarrigle, from Round Tower Integrated Primary School. TV presenter Christine Bleakley checked out her true ‘lung age’ with Gerry McElwee from Cancer Focus NI, and Clarissa McSorley from Boots, Belfast. 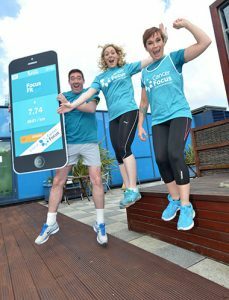 Weather presenter Cecilia Daly and broadcaster Jim Fitzpatrick launched our Focus Fit App with Niamh McDaid (centre), Cancer Focus NI. 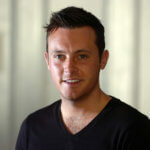 Radio presenter John Daly was the Cancer Focus NI ambassador for the Belfast Marathon 2013 and compered the ManAlive conference during Men’s Health Week. 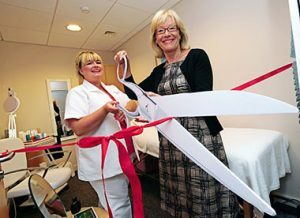 BBC presenter Wendy Austin officially opened the new Beauty for Life treatment facility with Beauty Therapist Fiona Barr.